As people have become more and more energy conscious, companies have looked for more options to produce and use energy more conservatively. With this movement of green/clean energy, solar energy has been high on the list of alternative energy options. Solar energy is now reaching mainstream popularity. Consumers are learning of the benefits that solar energy has to offer and are turning toward solar power as a viable, energy-efficient way to provide electricity for their projects. Solar energy essentially offers consumers an endless supply of power. As a renewable energy source, solar energy is becoming immensely popular with corporations, and businesses around the world. Solar energy converts sunlight into direct current (DC) electricity. This is done through photovoltaic (PV) cells in the solar panels that draw in the sun throughout the day. The DC electricity generated from the panels is then converted into an alternating current (AC) electricity that is sent to the electrical panel. With this system, lights, etc are running on solar power, and well-engineered photovoltaic systems in an area where there is a lot of sunlight, such as Florida, can sustain a large portion of the projects electricity. The Sunshine State is one of the best places for solar systems. Florida business owners and developers often generate a surplus of electricity during daylight hours that will run the power supply through the night. 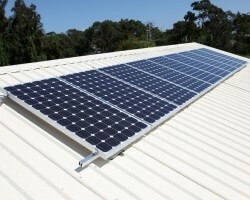 Also there is new technology being created everyday in regards to solar systems, such as Solar Shingles. Solar Roof Shingles or A.K.A photovoltaic shingles are shingles that use solar technology to create electricity from the sun as well as protect the roof like a tradition asphalt shingle. This type of technology has been around for a while, and was first used on satellites in space. 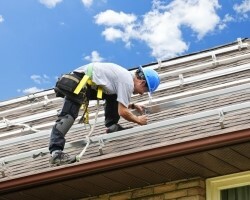 With new advancements in solar shingle technology, they are now much more viable, and effective. Whether you are interested in solar panels, tile, or shingles, Pinnacle A Roofing Company will assess your project's roof, and discuss the best options for you.